First off I'll say I was going to put this under the MMORPG section but it said something about having permission, so it comes to general. Once while playing AO & chatting on TS we were talking about AO generally, but I tend to reflect on the original RPG (Dungeons & Dragons) & how it spawned so many other RPG's, some better, some worse, well I bring up the matter of creation of D&D, the original RPG to see Sword & Para's opinion of D&D ..& neither of them heard of it. I was surprised they never heard of D&D! I thought every RPG style gamer knew something of D&D, I was probably 8 years old by the time I heard of D&D though I never played it 'til the mid-90's because no one I knew played it, actually I played the AD&D version. D&D inspired a cartoon that I remember watching in my youth in the 80's http://www.imdb.com/title/tt0085011/ , also a movie at the turn of the century http://www.imdb.com/title/tt0190374/. I have probably about $600 worth of AD&D books/guides I bought back when I played, 1 full blood red set of dice, 1 full transparent-gold sparkle set of dice, & 1 complete set of noob color coded dice including a 100 sided dice, yes a one hundred sided dice, no campaigns but when you have a DMG & character guides all you need is imagination, in playing the only limits are by imagination. So back to the 1st topic, sorry if this shouldn't be here but hope you found it interesting. ....Para and Sword never heard of D&D? What, do they live under a rock? That's what started it all! I've never played it myself but I've definitely heard of it. I've played some other pretty intense board games (Battlestar Galactica, Arkham Horror, and Twilight Imperium), but I've never heard of 100 sided dice. That's got to be pretty close to a complete sphere! lol. I think Khaliss misunderstood. Of course I have heard of D&D. I thought you were talking about a computer based version. That I don't recall. I remember watching other people play the dice based versions and thinking I could never get into that type of game. Some ofthe people I watched play were really serious, they all dressed the parts that they played. I do understand the imagination aspect of it. I have a huge imagination. I was just not a huge fantasy buff, my thing is, was and always will be Sci-Fi. If there was an equivalent Sci-Fi game I may have been interested. I'm glad the RPG aspect of gaming was invented so that AO could be created. I have never played any of the fantasy based MMO's or even just RPG's. It's the Fantasy thing. I never really read any fantasy until a few of my favorite authors decided to try their hand at it. Larry Niven for one,wrote several fantasy stories which I enjoyed. It was a cross-breed between Dystopia and AO that I had in a dream. Was a world where government was brought down by 5 huge corporations and all 5 corporations were in constant war. Everyone worked for these corporations except clan factions who essentially developed high-tech civilizations with a 3rd world asthetic look. One corporation tracks down about 50 clan faction cities and launches and all out assault on these civilizations killing nearly all its inhabitants. Player wakes up in a police transport surrounded by other clan factions with either similar or different outlooks depending on the users background story they develop for their character. Characters then decide how they will seek their revenge. (essentially summerized - I still have my write up of rules and background stories if anyone is ever interested). Surprisingly this one worked out quite well and held everybodies interest for quite a while, especially the overall flexability I gave all players at the very beginning development stage of their characters. Based off of a D6/D20/D100 depending on situations. ...... ...but I've never heard of 100 sided dice. That's got to be pretty close to a complete sphere! lol. 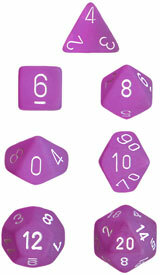 getting back to that, some of you have probably seen versions of 100 sided dice, online or elsewhere, the kind I have is like the one shown in the image below; the pair above the 12 & 20 sided dice on the bottom in there. The thing about using a 100 sided like that is defining how to roll a 1, a 10, or a 100 & that there is no zero since there is no zero on other dice.